Less than a week before, Lamar Odom was arrested on suspicion of DUI after he was involved in a three-car collision on the exact same freeway. The LA Times claims the incident took place around 6 p.m. and the journalist named Adolfo Flores alleges that Lamar Odom became reluctant to hand his insurance details over. It is the latest twist in a worrying time for Khloe Kardashian’s husband, who was arrested on suspicion of driving under the influence in the early hours of Friday morning. To make matters worse, it has now been revealed that Lamar Odom was paid a visit by two drug counselors just hours before he was charged with a DUI. TMZ reports that the counselors – who work with the National Basketball Players Association – contacted Lamar Odom to offer help and he accepted. During the visit to Lamar Odom and Khloe Kardashian’s house, TMZ reported that he was very receptive with a source telling them “it was very positive”. However, after the pair left, Lamar Odom then got into his vehicle and never came home. 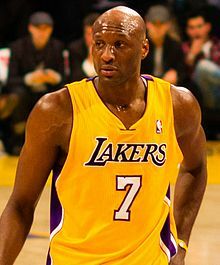 The NBA star was later held at Van Nuys police station on $15,000 bail but was released from custody at 8.30 a.m.
Lamar Odom was pulled over just before 4 a.m. for driving too slow at 50 mph on the 101 Freeway in the San Fernando Valley. He did not immediately respond to police, passing three exits and driving erratically, TMZ reports. Lamar Odom failed numerous field sobriety checks but refused all chemical tests, according to police. After “failing” field sobriety tests, Lamar Odom was taken into custody and Leland Tang said: “He did what no one should ever do, he refused the chemical tests.